We have enjoyed an adventurous 10 years RVing across the USA. It was a life change made not without some reservations, but our previous experience in a motorhome gave us confidence. Touring America was better than we dreamed. We visited almost all the states of this country. 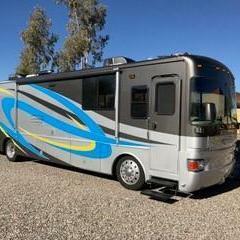 However, now we will be coming off the road, buying a house, and liquidating our motorhome and pad in Mission Texas. This will be another major life change. We are ready though to spend time with our grandchild. We cherish every memory from the years of traveling. If you are considering full timing go for it. We started our full time adventure several years ago. After only 2 years we decided to buy a sticknbrick in Florida, mainly due to the housing market at the time. Another 2 years went by and we missed being on the road full time so much the house got sold and here we are again. This time we are staying out as long as our health will allow it. Love this lifestyle. Hope you enjoy the new chapter in your life.